The 27-foot high, 360-degree video wall in the Freedom Hall of the George W. Bush Presidential Center presents new challenges and solutions to installing digital signage in an intimate setting. Installing a video wall in a small, intimate setting rather than a large venue like a stadium or outdoor space makes for a very different project. The video wall in the George W. Bush Presidential Center in Dallas, Texas illustrates this fact with 360 degrees of photorealistic imagery. The GWB Foundation asked David Niles of Niles Creative Group, specializing in innovative media and content delivery software, to create a welcome exhibit for Freedom Hall at the Center. Niles envisioned an inspiring large-scale visual display and brought the project to Barco LiveDots, a Barco company. 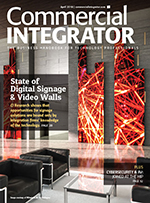 Click here for Commercial Integrator’s Digital Signage eBook. The result is a high-resolution C5 LED display that sits 27 feet in the air on all four walls of Freedom Hall, 220 feet by 21 feet in total. As visitors enter the space, they are greeted by what looks like a still painted mural with gorgeous views of Texas plains. Then the mural begins to change, day turning to night and the plains turning to mountains. The show begins with time lapse views of Texas, transitions to a scene of 100 various people characterizing American life, and closes with a flyover view of Washington D.C., the pictures of former presidents, and the title of the piece, “We the People.” Set to an original soundtrack, it is a tribute to the country and the American people. But there are challenges to doing a video screen installation so close to its intended viewers. The audience is much closer than at a stadium or say, in Times Square. During the design, Barco took into account the steep angles by which viewers would be absorbing the content, even those directly underneath the screen. It is tricky to maintain color and brightness from all angles of visibility. The best display screens of this kind might allow for around 60 degrees between the screen and the eye, at the most. This screen allows for 70-75 degrees. Freedom Hall is adorned with many windows, so the screen has to counteract potential color and brightness shifts in the room. Barco furnished the wall with a contrast ratio in the 4,000:1 range in order to render colorful, rich images. The LED tiles allow for consistent imaging no matter the light in the room. Weight is also a challenge as the wall is 27 feet in the air. The tiles weigh more than 12 pounds each—35,000 pounds in total across the entire 360 degrees and four walls of the display. To make sure all four screens sit securely on the walls, the tiles are mounted firmly to the wall behind it and reinforced with steel from above. Temperature is yet another component that one might not initially take into account. The LEDs are protected by an air circulation system behind the screen so that the image is not eventually affected by the potential heat of the room. It is in Texas, after all, and heat rises! The last, but certainly not least, element of this video wall is that it is autonomous. The Center needed a maintenance-free, automatically operated video solution. The show repeats every 15 minutes for seven minutes of content so that all visitors on their way to the library or museum can see it. Niles Creative Group’s content delivery software enables auto looping without the Center having to manually navigate or engage the software. It is also a maintenance-free system with the ability to conceal any individual LED failures that may arise, in order to maintain consistency over time.